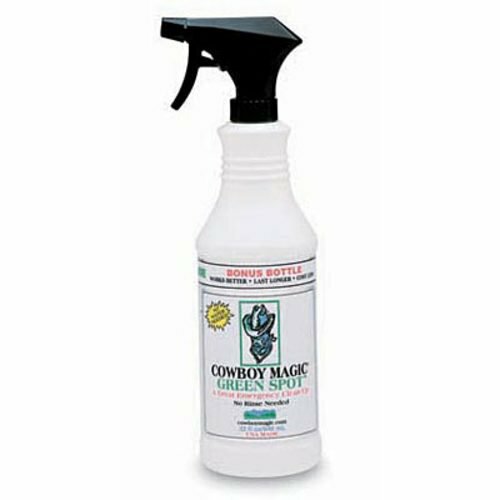 Cowboy Magic Greenspot Remover is a concentrated formula which helps to remove manure, urine spots and wet and dried sweat instantly. Made from natural, non-sudsing cleaners derived from plants which break down and dissolves foreign molecules. Also contains added silk which strengthens the hair and conditions the skin. Water, Sodium Laureth Sulfate, Cocamide DEA, Cocamidopropyl Betaine, Glycerin, Honey Extract, Rose Flower Extract, Sage Leaf Extract, Nettle Extract, Matricaria Flower Extract, Peppermint Leaf Extract, Comfrey Extract, Horsetail Extract, Witch Hazel, Tetrasodium EDTA, Polysorbate 20, Propylene Glycol, Diazolidinyl Urea, Methylparaben, Propylparaben, Fragrance. Below are some recent questions we've received regarding Cowboy Magic Greenspot Remover for Horses, including answers from our team. I would expect this to be safe and effective but obviously a small puppy should not be allowed to swallow the product. You should use it with a little water, then towel dry and brush the coat afterwards.